if everyone lived as profligately as Americans, according to a report issued Tuesday. 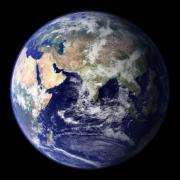 Humanity would need five Earths to produce the resources needed if everyone lived as profligately as Americans, according to a report issued Tuesday. "We are demanding nature's services -- using resources and creating CO2 emissions -- at a rate 44 percent faster than what nature can regenerate and reabsorb," the document said. "That means it takes the Earth just under 18 months to produce the ecological services humanity needs in one year," it said. And if humankind continues to use natural resources and produce waste at the current rate, "we will require the resources of two planets to meet our demands by the early 2030s," a gluttonous level of ecological spending that may cause major ecosystem collapse, the report said. Global Footprint Network calculated the ecological footprint -- the amount of land and sea needed to produce the resources a population consumes and absorb its carbon dioxide emissions -- of more than 100 countries and of the entire globe. The think-tank worked out how many resources the planet has, how much humans use, and who is using what. Back in 1961, the entire planet used just over slightly more than half of Earth's biocapacity. Today, 80 percent of countries use more biocapacity than is available within their borders. They import resources from abroad, deplete their own stocks and fill "waste sinks," such as the atmosphere and ocean, with carbon dioxide. The average American has an ecological footprint of nine global hectares (23 acres), or the equivalent of 17 US football fields. The average European's footprint is half that size, but still too big to be sustainable in the long term. At the other end of the scale are impoverished countries like Malawi, Haiti, Nepal or Bangladesh, where the footprints are around half a global hectare, or 1.25 acres -- often not even enough to provide for basic food, shelter and sanitation, the report said. But there are relatively easy measures that can be taken to slow the rot. "In most high-income, industrialized countries like the US and European countries, the biggest part of the ecological footprint is the carbon footprint," Nicole Freeling, a spokeswoman for the Global Footprint Network, told AFP. "One of the biggest things such a country can do to reduce its ecological footprint is to manage energy more efficiently and effectively -- for example, by investing in renewable energy and clean tech on the one hand, and resource-efficient infrastructure and compact urban development on the other," she said. Changing consumption habits can also reduce the global footprint. "While people living at or below subsistence levels may need to increase their consumption to move out of poverty, more affluent people can reduce consumption and still improve their quality of life," Freeling said.